Back from a much needed vacation, and ready to explore more ideas for incorporating mobile learning in the library! Google Moderator is another back channel option (like PollEverywhere) except it also allows the audience to vote on comments. For example, I can set up a Moderator series asking for topics students would like to review for the midterm. Students can submit as many topic as they wish, and they can also vote on the topics their peers post. Then, Moderator will sort the responses based on popularity. Moderator is easy to set up if you have a Google Account, and is available for Google Apps schools as well, just ask your administrator to turn it on. Once you have created your Moderator Series, you can share it on Facebook, Twitter, Google+, or by email, you can also post a web address for users to access the series. For help getting started. Here is a Moderator Series that I set up to get your feedback about what you might like to see on this blog! 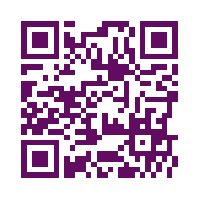 QR Codes, or Quick Response Codes, are becoming more and more popular in the business world. You can see them on your favorite cereal box, your carton of milk, on billboards, in magazines, in restaurants...you name it, you probably find one. What they are is a 2d barcode that turns text into an image. When someone scans the image using a QR Code Reader, they may be brought to a webpage, given contact details, shown a piece of text, a video, and image, or almost anything you can think of that is hosted on a webpage. Do you ever need to conduct research on something, but don't know where to start? Do you ever have a broad topic, and want to narrow it down? Once upon a time, Google offered a gadget called Google Wonderwheel. I found it, and was amazed. I used it in my sample lesson when I interviewed with my current school. It was awesome, it was amazing, and by the fall of 2011 it had disappeared. On more than one occasion I thought of it fondly, and how useful it was to teach students to narrow down their research topics. When you access their website, you enter what you would like to learn more about. The site tells you it is "grokking" and then returns with a graphic map, suggesting related concepts. On the right hand side you are given key fact, and also lists of websites, images, videos, quizzes and a glossary. Students can also create their own notebooks using instaGrok, keep track of sites they have visited, change the difficulty level of the results returned, and take the interactive quizzes to test themselves. Call me nerdy, but I am giddy about this tool! So what does this have to do with mLearning? mLearning is all about personalizing the learning experience for each learner, making connections and allowing them to expand their own lines of inquiry. Also, it does work beautifully on an iPad. I have not been able to try it on other devices though, so I don't know how it would do on a tiny screen. One of the biggest challenges I have had to overcome with using iPads in the library is the lack of Flash. This is particularly annoying because the eTextbooks we use require Flash to access them. How frustrating it has been to hand students log in information, but tell them they have to use the computers to access the books. Thankfully, this summer I discovered the Rover App for iPad. Rover is a web browser that specifically designed for K-12 education to give access to materials that were previously unavailable on the iPad, this includes resources like educational Flash based movies and games. Rover uses the iSwifter platform to run Flash on a web server. It has built in cloud based web filtering to ensure that what students access using the app is appropriate and it even comes with some built in content for elementary, middle and high school. It runs a little slowly, but that is to be expected when trying to stream Flash content. The best part is that it is FREE! I will be sure to install Rover on my library iPads so that when I hand out log in information for our textbooks, I can also hand out iPads so that students can work comfortably at tables. Rover opens so many doors for educational uses of iPads, and I can't wait to introduce it to my students! Audience Polling allows you to get instantaneous feedback from your audience, be it a faculty meeting or a classroom full of kids. This is just one of the many ways to incorporate mLearning into your classroom, and one way I intend to incorporate it into my library. PollEverywhere is Free! Participants can respond via text, the web or Twitter. You have the option of "multiple choice" or free response polls, so really the possibilities are endless. Despite the name, it only works in the US. Below is the poll I intend to use in the opening days of school to get an idea of what types of devices the students will bring to use in the classroom. This will help me and the teachers I work with plan activities based on the technology that is available to them. I will post the poll on the library website, and I will project it on the SmartBoards in classrooms when I collaborate with teachers. It is important to me to know what devices students are using so that if I plan an activity that requires the use of an App, I can make sure the App, or a similar one, is available for the devices they will use. Use as a back channel for students to take notes during lectures and activities (think of the movies you might show where students may not always pay attention). Having a back channel allows students to refer back to it to study for quizzes and exams. Quick assessment of learning objectives to make sure your goals are being met. Quick assessment of whether students did their homework, so you know how much time you need to spend on old concepts. Put up suggestions for field trips and allow the class to vote. 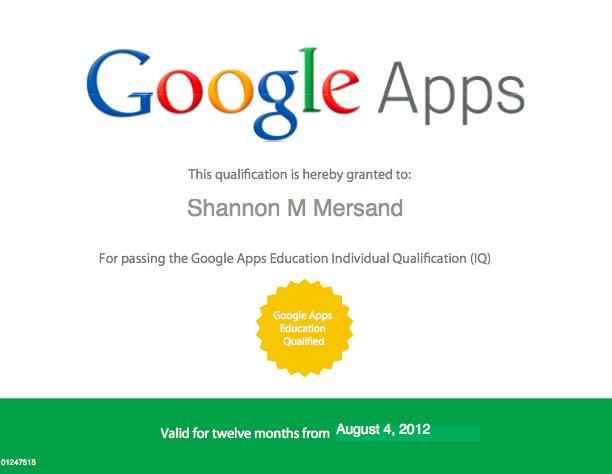 Google offers individuals a chance to become Individually Qualified in Google Apps for Education (and for some of their other products). They give you training modules, and time frames for working through them. Each test is $15, with a total of 6 tests to pass. The passing score is 80%, you have 90 minutes for each exam, and 90 days to pass all 6 exams to get the certificate. The certification is valid for 1 year from completion. You also have the option of completing other activities to become a Google Certified Trainer. When I set out this summer (along with my fellow district librarians) to become Google Apps for Education Individually Qualified, I had no idea what I was in for. I have been using Google Apps personally for years, and thought I had it pretty much down. I printed out all of the learning modules anyway, and skimmed through them. As suspected, I knew most of it, so I challenged myself with the Mail test. Yikes! For a company who thinks they are changing the face of education, Google certainly has a lot to learn about creating assessments to actually check for comprehension! What I learned was that the exams they give test your photographic memory of the phrases used in the training modules, but not your actual ability to use their products. I had envisioned some sort of virtual environment where they asked you to, say, "create an email to John Smith, and add a picture" or "organize the inbox files to be displayed alphabetically," you know, testing my ability to use the product effectively. Instead, I found multiple choice questions where the correct and incorrect answers were just one word different, and almost all of it was taken directly from the training modules. Alas, I have finally finished all 6 exams, and here you have it, I am officially certifiable! 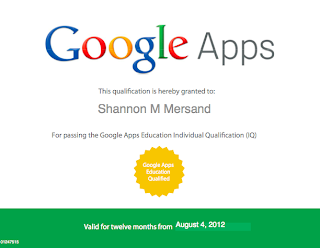 Am I any more qualified to use Google Apps for mLearning this year? No, not really, but I did learn a few nifty things I didn't know before, and I have one thing crossed off of my summer To-Do List. I created this video to introduce students to apps that are available to help them conduct research. Any other suggestions? This summer, as with every summer in the past 14 years, finds me learning new things, and hoping to apply them in the real world. And, as with other summers, I make a list in my head of all of the things I hope to accomplish this school year. Actually post to a blog on a regular basis about what I am doing with technology and information literacy. Work with fellow School Media Specialist Jeri Hurd to develop a series of mobile lessons for information literacy. Work with Jeri Hurd to turn those lessons into an interactive iBook. Try not to get involved in too many other projects which will sidetrack me from my ultimate goal. A guest blog post written for Schoology about my experience using it in the Fall and Winter of 2011.